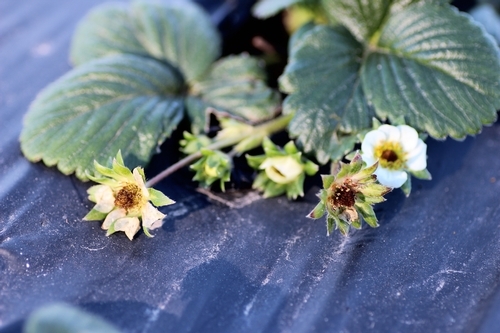 Unusual cold weather during the past few days is a concern for the strawberry growers. Second year crop and cultivars that produce early or late can influence the extent of impact experienced by the growers because injury depends on the stage of development. Damage: Low temperatures could completely damage the flowers or injure developing fruit tissue resulting in misshapen fruit. 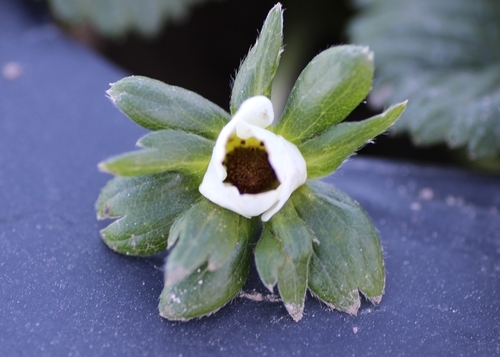 Pollination is also affected if temperature drops below 60 oF (15 oC) during flowering. As a result, some achenes do not have a seed, remain small, and cause fruit distortion. Cold injury can also cause fruit with multiple tips. 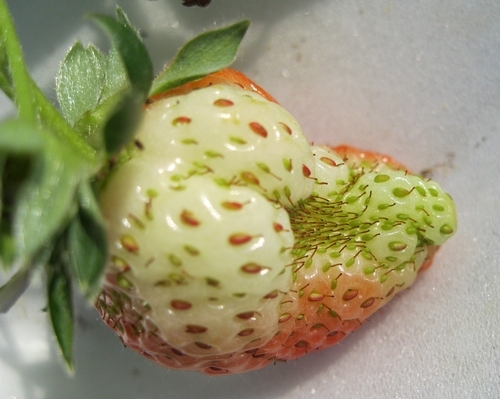 Distorted fruit from lygus bug damage have uniform sized achenes, but the achenes affected by cold injury are much smaller than those on unaffected parts of the fruit. Protection: Sprinkler irrigation can protect the fruits from cold injury when there is no or low wind. Freezing water releases heat and protects the flowers and fruits as long as temperatures do not fall below 23 oF (-5 oC) on still nights or 25 oF (-4 oC) when wind speed is no more than 2 mph. If wind speed is more than 4 mph, sprinkler irrigation is not recommended. Sprinklers must be started before the temperatures drop to freezing levels and continued throughout that period. The time to start irrigation for frost protection depends on the dew point. If the dew point is low, irrigation has to be started before the freezing temperature. The following table shows when irrigation should be commenced depending on the dew point. Water should be applied at 0.10-0.15 (0.25-0.4 cm) inches per hour through sprinklers to provide adequate protection. Discontinuing sprinkler irrigation during the frost period can cause more damage. If sprinkler equipment is in shortage, limit the area to be irrigated. Sprinkler irrigation to an upwind or uphill field may provide some protection to an adjacent field downwind or downhill. Drip irrigation can also provide some protection by wetting 6-12 inch (15-30 cm) of soil before the frost period. Wet soil stores and releases more heat than the dry soil. 2008. Integrated pest management for strawberries. Second Edition. UC ANR Publication 3351.